Nigeria will not be getting a new national carrier in December or early 2019 as previously planned. The national minister for aviation tweeted this evening (Sept. 19) that plans for the airline have been suspended. The plans for the new carrier, named Nigeria Air, complete with a logo unveiling, were announced at Farnborough, a renowned international aviation exhibition in London back in July. The government claimed it would not own more than 5% of the airline, ceding control to private investors expected to invest $300 million in the new airline at inception. It’s unclear if the government ever found investors for its private partnership. The plan for a new airline was given a lukewarm reception by Nigerians who have seen a string of previous national airline run aground. The most recent carrier, Air Nigeria, shuttered operations in 2012 after running up 35 billion naira ($96 million) in debt. Undertaking a major capital intensive project with notoriously slim margins in a difficult market was also unlikely to win unanimous public support especially as Nigeria’s government struggles to fund record budgets and pay workers’ salaries. To win public support, much of the government’s rhetoric in pushing plans for a national carrier has been hinged on national pride. It’s a trend that is prominent across the continent as several countries actively pursue plans for national carriers despite evidence of financial struggles. South Africa’s national airline, for example, has not generated profits since 2011 and has required cash injections to stay afloat. But in solitary contrast, Ethiopia Air has grown to become the continent’s largest and most successful airline. 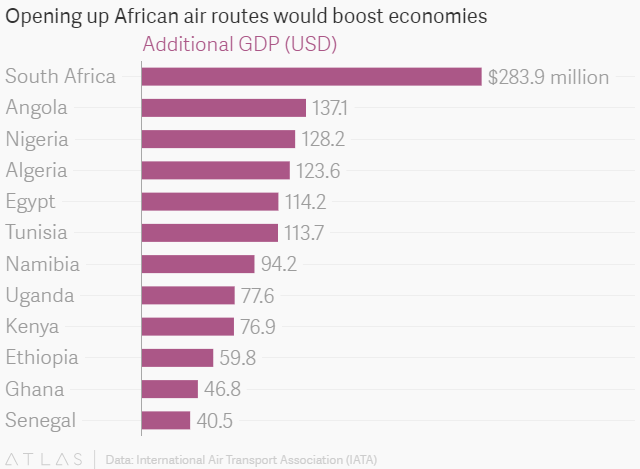 A quicker way to boost aviation across the continent is liberalizing air routes and cut high airport fees and local taxes, according to 2014 study by the International Air Transport Association (IATA). It projected that opening routes between 12 key African countries could add an extra $1.3 billion to the continent’s annual GDP. And the African Union has finally set on that course with the establishment of the Single Africa Air Transport Market in January.